Hello All. We finally got a chance to take our '86 2461 for it's maiden camping trip. We had a good, but very rainy, Memorial Day weekend. Although, we did run into an electrical problem that I'm hoping someone here can help me solve. This is the first time that I've hooked up to a 30 AMP campground service. At, home I hookup to a properly wired 20 AMP outlet, with no problem. When I connected to the campground 30 AMP service, the breaker on the service pole immediately popped. Next, I used a dog-bone adapter to connect to the 20 AMP service on the pole. The 20 AMP breaker popped too. Next, I added a 3-prong to 2-prong ungrounded adapter. The breaker held that time. Using the ungrounded adapter told me that I had a ground/neutral bonding problem. So, I tripped all of the breakers in the coach off and connected to the 30Amp service. Then, I flipped the breakers on, one at a time, until the service breaker popped. This test narrowed the problem down to the circuit that feeds the 12-volt converter/charger. I opened the converter to verify that I didn't have a short to ground somewhere. Everything looks clean. But, I did notice that the grounds (white wires) for all of the 12-volt circuits go to a grounding bar on the outside case of the converter. The converter case is grounded (bare copper wire) to the trailer frame, which is connected to the Ground bar in the AC distribution panel. So, the ground and neutral are bonded in the converter. I've read elsewhere, that many campgrounds have switched to a floating ground system. Connecting a bonded ground system will trip the service breaker. So, I disconnected the ground wire from the converter case. Presto, chango! Everything works now. As a precaution, I used a multi-meter to test the potential between the converter case and the AC ground bar. They are with about .015 volts. So, everything appears to be safe. Now, for my question. Did I do the right thing? If not, what should I do instead? Thanks for any help you can pass along. I have had similar problems and it turned out to be the GFI in the trailer and a GFI on the power pedestal. I now have a 3 prong 30amp to 20 amp adapter plug with the ground cut off. Be careful that you don’t invert the connection as you could make the rig Hot. You should have a polarity tester to first check out the shore power. I would restore the rig wiring they way it was. I carry a circuit tester with me to check the campground shore power before plugging in. This at least lets me know if there's a problem with the campground power. Mmmm, that circuit polarity tester is a really good idea Hutch! Another item that I need! The converter case is grounded (bare copper wire) to the trailer frame, which is connected to the Ground bar in the AC distribution panel. So, the ground and neutral are bonded in the converter. Let me see if I can help. Something is not adding up. I have re-read your post now 5 times trying to make sure I understood your words right. Tell me where I miss read. First off, if the campground is declaring a "floating ground" or "above ground" system I would question this. There are certain industrial circuits where DC common is isolated from earth ground do to electrical noise issues. Some work better grounded to earth and some do not. It depends on what you are doing and what type of electronics. BUT in the AC world, AC neutral is suppose to be common with earth ground at only one place, in the breaker box. Single point grounding. The ground should not be floating. If they are really doing this, it would be real interesting what NEC code allows this in a public campground. May learn something new here if this is for real on purpose and sure would want to know why???. Now on the TT world, the frame of the trailer is part of the DC common circuit just like in the auto world due to the battery, tail lights etc. and the convertor DC common is part of it as well since it is charging the battery . So the convertor DC common has a tie to the frame of the camper. Now back to the AC grounding world in a camper. Since 120VAC is used, any exposed metal needs a earth ground to it in case someone touches it and a short in the AC system is present to that metal. in the short case, the human then becomes the path to ground if it is not grounded. Not a good thing. And since the frame or other metal parts are tied to DC common, Earth ground is also tied to DC common. But AC neutral should be separate even though there should not be any potential between the two. So, I tripped all of the breakers in the coach off and connected to the 30Amp service. Then, I flipped the breakers on, one at a time, until the service breaker popped. This test narrowed the problem down to the circuit that feeds the 12-volt converter/charger. Sounds like you have a metal cased convertor. And if so yes it should be grounded to earth ground and if you lifted that ground off if I understand it right, then there is a shock potential there. 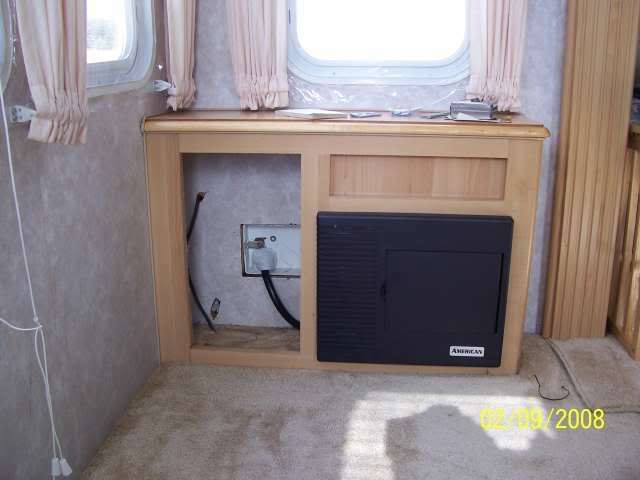 AC neutral inside the camper should be isolated from ground. It should only be common at the 1 tie point at the main AC power source point if we are following single point grounding principals. My wring diagram from Sunline shows AC neutral separate from earth ground on purpose. Now to the DC common to the grounding bar, like I pointed out above, DC common and TT frame are going to be tied to each other and frame is tied to earth ground. OK now you lost me, did you say “AC” neutral and ground are bonded in the convertor? I missed how you came to the conclusion, by the words in that sentence. DC common and earth ground are all tied together by the frame ground wire, yes, but AC neutral, well no. Is AC neutral tied to ground in your convertor by a wire? BUT, you said when you turn on the AC to the convertor you end up with a breaker popping at the campground but not at home. All the puzzle pieces still do not fit. If you have one of those polarity checkers Hutch showed you, you can test your circuit at home you plug into. If not and you are AC world meter friendly, check voltage from AC hot (the short vertical blade) to AC common ( the long vertical blade) in the receptacle, you should get 120, then AC hot to earth ground, you should get 120, then AC common to earth ground, you should get 0. Only do this if you know what you are up to and by your post it sounds like you are electrically friendly. Also if that meter has ohms in it, unplug shore power from the camper. Unhook the 2 AC power feed wires on the convertor. Do a check from each wire to the case ground and earth ground wire. They should both be isolated from ground. If there not, then we have an issues to work on here in your convertor. If your house receptacle is right, and your convertor does not have either power feed leg common to ground, I suspect what is occurring is the power pole at the camp ground is having issues. To trip a 20 or 30 amp breaker that fast, AC hot is tied to earth ground or AC neutural some how. AC neutral to ground if wired right will not do this. PS I do use one of those testers Hutch showed and I have an adapter to go from 120, 20 amp to 120, 30 so I can use it on the 30 amp line at the camp ground. One of my buddies did bump into a CG with no ground and he told the owner and they moved him and shut that site down. He found it with one of those testers. PS 2 see here if this helps. 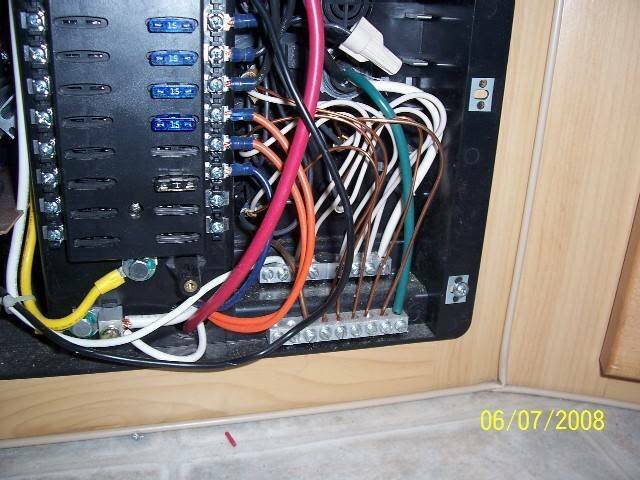 This is the wiring diag Sunline gave me on my 2004 camper http://www.sunlineclub.com/docs/2499wiring.pdf You can se on page 2, the battery negative is tied to the TT frame. Also note on page 1, AC neutral should be isolated from ground in the convertor. So at least in 2004 Sunline seemed to be following single point grounding rules. What year is yours and what /brand model convertor? Want to find a wiring diagram on it. Thanks for the reply and the analysis. I do have an outlet tester (like Hutch posted), but I didn't have it with me that weekend. So, the entire problem may have been caused by a hot/neutral wiring problem at the campground power pole. I have tested the circuit that I plug into at home and it is wired correctly. The trailer is at the dealer having an awning installed. But, when it gets back, I'll do a continuity test in the converter. Thanks for the suggestion. But, if there is a dead short on the AC side of the converter, how could the converter continue to work? Wouldn't it burn itself up pretty quickly? Here is the thought process. You will have to ring this out on your TT to see where this might not be right or is. Follow this thought process and see if it fits. Ok your house receipt is correct. Good. So we now know this is right. If Sunline did follow single point grounding principals and the ground and Neutral are isolated in your camper every where BUT the convertor. When you plug in at home since your receptacle is wired right, hot and neutral are isolated. Hot and ground are isolated. So far so good. BUT if in the convertor the neutral has a tie to ground, you will never know this at home. Your hot is already isolated from both. If the voltage potential goes in on the convertor hot side, thru the convertor transformer, the transformer is a load, and then out the other end of the transformer to ground and or neutral. It will work as the transformer is the load between hot and ground and not be a dead short. Technically all you need is a hot wire, a load of some sort and earth ground to make a AC circuit work. The neutral is part of the saftey circuit. Now go to the camp ground. Their hot and neutral are flipped wrong. You plug in, now the neutral in the convertor is hot as the incoming line is switched. That neutral is live and since you “might” have a ground common to neutral in the convertor, you now have a dead short. The breaker trips. So you lift the ground off the convertor case at the camp ground, now the breaker does not blow even though the neutral in the TT is live. All normal camper type AC devices you plug in the TT if they are made correct to code will not have a neutral and ground tie inside them so things work and the breaker does not blow. While it works, it is not safe with the hot and neutral flipped pending the exact device. This is the thought process. OK what did I miss? Please let us know what you find as I too have learned from your post thinking hard on how this can be caused and I might not have hit on it yet, but something is not right. If it works at home and trips the breaker at the CG, something is not right. I think I follow your logic. But, I'm still trying to get my head around how the converter works. I'd like to think that I know residential AC and automotive DC pretty well. But, I have to admit that I don't know the first thing about travel trailer converter/chargers. 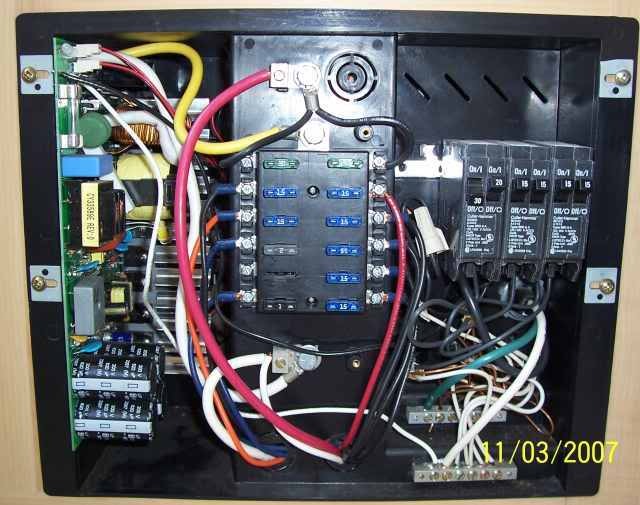 Do you have a wiring diagram for a converter? Logically, it certainly sounds like the hot and neutral were crossed at the campground. But, I would be very surprised if that really was the case. I strung a long drop cord to my in-laws site, next to ours, and popped their power pole breaker too. So, the problem wasn't just a miswired outlet at our site. If there is a miswire, it must have been, at least, one whole section of the campground. And, my in-laws trailer didn't have any trouble. That's what makes me think that the problem must be inside our converter. When I get the trailer back, I'll reconnect the ground wire to the converter and investigate a little deeper for an AC neutral to ground somewhere inside the converter. Thanks again. This is an interesting post. You now have my curiosity up big time. We have to help you figure this thing out. I think I follow your logic. But, I'm still trying to get my head around how the converter works. I'd like to think that I know residential AC and automotive DC pretty well. John, I can tell you have been around this before, you will do fine. There is nothing magically in a camper that does not exist in a house/auto in some fashion. The gas appliances in a TT work like in a house. The fridge, well that is a little different, gas furnace and HW heater follow standard gas technology. I’m not by any stretch of the imagination an RV expert, I just have come at this from and industrial machine background and figure it out on the way in. You can too. But, I have to admit that I don't know the first thing about travel trailer converter/chargers. 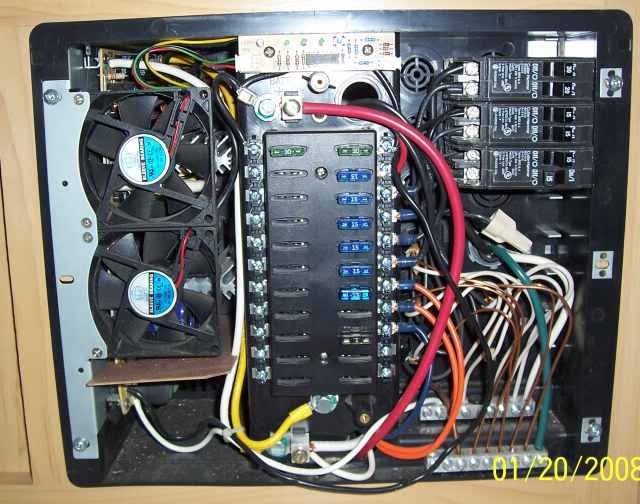 Do you have a wiring diagram for a converter? I do not have a wring diag, but something close to explain this to you. If I had a circuit schematic I could drill down closer as back in the day when TTL control logic (transistor to transistor logic) was in before the age of “programmable” I use to do some of this. See if this helps. My converter is in a plastic case. It is by default double insulated. I thought yours was in a metal case which what stemmed the ground wire on the case. Here is TT power converter 101 (The 50,000 foot version…) in lack of a actual schematic this is was I can see from the actual components and viewing the circuit board. * 120 VAC comes on the 14 gage white and black wires. * They then put that square wave 20 VDC into the DC line capacitors and create a smooth 20 VDC. This is the simple part. They basically created a 20 VDC power source. * They then have a voltage modulation control circuit that senses the 13.2 VDC output to the TT. 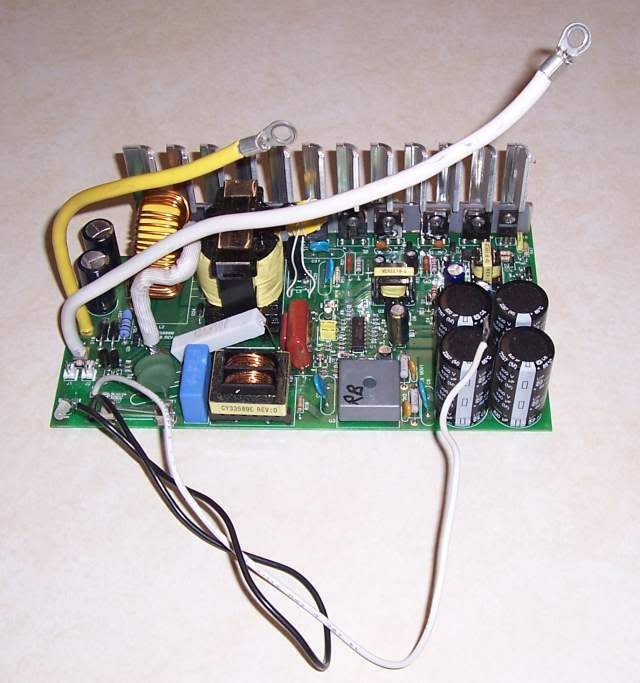 * There are heavy power transistors attached to a heat sink to handle the heavy current. This converter has 60 amp output. * Pending the TT current draw and the status of the battery charge status, the converter modulates the current to fit the need and the voltage to meet the charging needs. The 13.2 VDC would modulate up to like 13.6 to charge then drop down to the 13.2 to trickle or float charge when the battery draw slows down and there are no TT 12 volt devices drawing power. 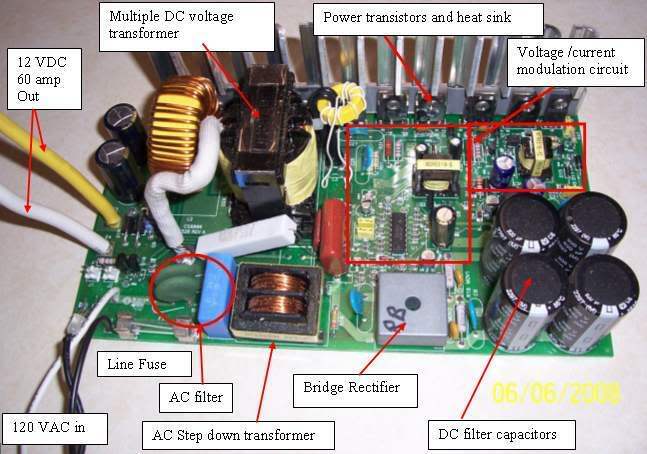 * I believe the DC transformer is used to create the different DC voltages needed for charging. It has multiple center taps which would create different voltages. So that is TT power Converter 101 the best I can read this circuit with what I have to work with. Yours I’m sure does this in a similar fashion even if it is a different brand. OK this is some more good info. You in-laws camper, do they have a metal case converter or a plastic one like mine? There converter may very well not have a tie in their converter between AC neutral and earth ground. Yet their system could work on a reversed AC hot and neutral as theirs could be not tied to ground. You plugged into there power box and still tripped the breaker while theirs did not. The CG could still be reversed just theirs works and yours does not. Yes I agree in your converter somehow AC neutral is tied to ground. At your house since you have the correct AC polarity you will never find the issue unless you go hunt for it. But switch that polarity and it will trip the breaker in a heart beat. 1. The CG has a revered hot and neutral. 2. Your converter some how has a tie from neutral to ground. Check your converter inside if the circuit board is some how touching the metal case on the neutral wire. I do not know the older converters and I do not know if they ever built them internally to have a ground neutral tie. Single point grounding goes back a great number of years and I cannot figure out why they would make it that way on purpose. And your 1986 camper should have been setup for it. Do you have a model/brand of the converter or some close up pics? I can go hunt on line to see if I can find anything about it. Good luck and for sure let us know what you find out. So, I disconnected the ground wire from the converter case. Presto, chango! Everything works now. As a precaution, I used a multi-meter to test the potential between the converter case and the AC ground bar. They are with about .015 volts. So, everything appears to be safe. DC common and ground can be tied, no problem with this. You said you checked voltage from the converter case with the ground lifted to AC ground bar and only have 15 milli volts. H’mm this one has me but something is not adding up. If you have no potential from case to ground bar then why would unhooking the ground wire make a difference??? Unless they have no ground at all on the incoming shore line cord at the CG. Which I hope is not the case. The TT is insulated with the tires, but unless you use wood under the tongue jack and stabilizer bars the TT frame should of made some kind of ground. Check that your shore line cord ground for continuity to the ground bar in the power box in the camper. Maybe your shore line cord has a break in it too. 1. Check continuity between the ground on the shore power cord and the AC ground bus. 2. Disconnect converter from AC power and check continuity between AC neutral input wire and converter case & frame ground. Then, check continuity between AC hot input wire and converter case & frame ground. Can you think of anything else that I should check on? Thanks. And here is a close up of the ground bar and AC neutral. There is no direct tie. So I did an ohm check on the shore line cord plug as well. DC common is tied to ground but this is normal. I could tell this by looking at the wiring and since we have AC inside of 120, it has to be. The 3.5 meg is a back feed in the system and what the system resistance i2, but the 2 ohm is true tie as it should be. So the ohm meter shows what the wiring and theory is at least in 2004. Your 3 hit list items should turn something up to help point you where to dig deeper. If those 3 come up totally clean…. Well, have to think harder….